Eventually the cooling system was filled; at 200 gal, it takes some time. Once the charger was disconnected and all the cords and the hose pulled, I gave it another go. Giving the layshaft a couple of inches I pushed the start button; the engine turned over, but not fast enough. At this point I suspected a problem with the batteries, and decided that it would be best to not draw a load from them until checking their condition. Voltage wise they hadn’t dropped significantly, which means the batteries were low on water or there was a shorted cell. Steve Habeck, the keeper of the batteries, was thus sent a text message of the situation. At that point nothing could really be done until the next day in which Steve and I would have to take a look at the batteries. The following day, being Saturday the seventh, was a board meeting day. Following the board meeting a group gathered at the West end of the shop for the verdict on the batteries. Each battery was checked individually while the engine was turned over (via the starting circuit). The discovery being that the fireman’s side battery had indeed developed a short. The decision was made to pull the batteries and replace them with the ones in the rotary plow snail. This would have to wait though, due to scheduling constraints from my classes and other people’s work schedules. It would be another week and a half before anything more would be attempted. I arrived early on Thursday the 19, and set about cleaning in and about the machine shop, waiting for Habeck and Poindexter to arrive. 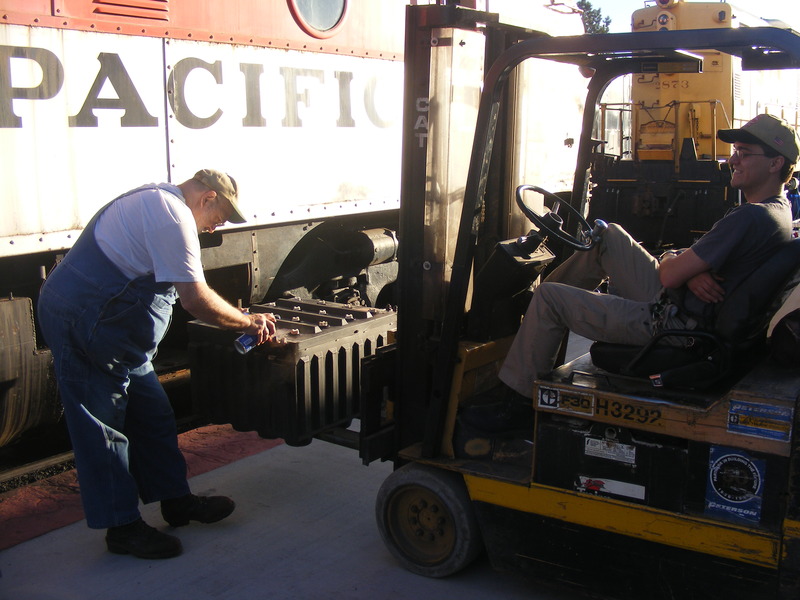 About an hour later, I was greeted by McClain and Whetstone who had come up to install the hydraulic rams back onto the white forklift and continue repairs to QRR 1100. With their help 917 was moved over the oil pan, a location more readily accessible by the electric forklift. Within an hour and a half Steve arrived, and work could finally begin on getting the batteries swapped. The batteries were removed and the battery boxes washed out. Clean battery boxes are important! The right side battery box. The left side battery box, sans offending battery. While waiting for the battery boxes to dry, Habeck and I needed to rearrange the battery house to get 917’s former batteries put away. It’s a little easier to walk inside, having swapped the over-sized pallets by the large swing door with one of a more reasonable size. 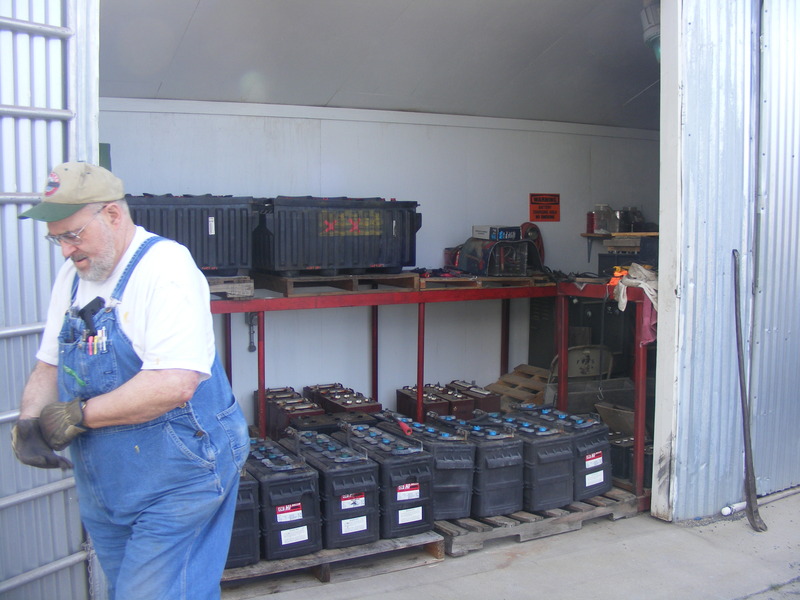 Steve Habeck places the first of the two batteries on the rack. Everything placed back in order, Steve shuffles off in triumph for a quick rest while we await the arrival of Poindexter. Having completed the the task of getting the batteries put away and the battery house arranged to Habeck’s liking, we then took a brief respite while we waited for Poindexter to arrive. Luckily that wasn’t long, and we were back to work within the hour. At this point we had to fire SP2873 back up and pull four rail to get the rotary set over to a ‘forklift accessible’ location. Once both batteries were removed from the rotary snail, everything was put back on four rail and 917 was spotted at the loading platform alongside three rail. Before placing the batteries into 917 we decided this would be an opertune time to service them, and both batteries had their water levels topped off. We were about to start putting batteries back in 917 when we noticed that the connectors were different; both locomotive and batteries had male connector ends. 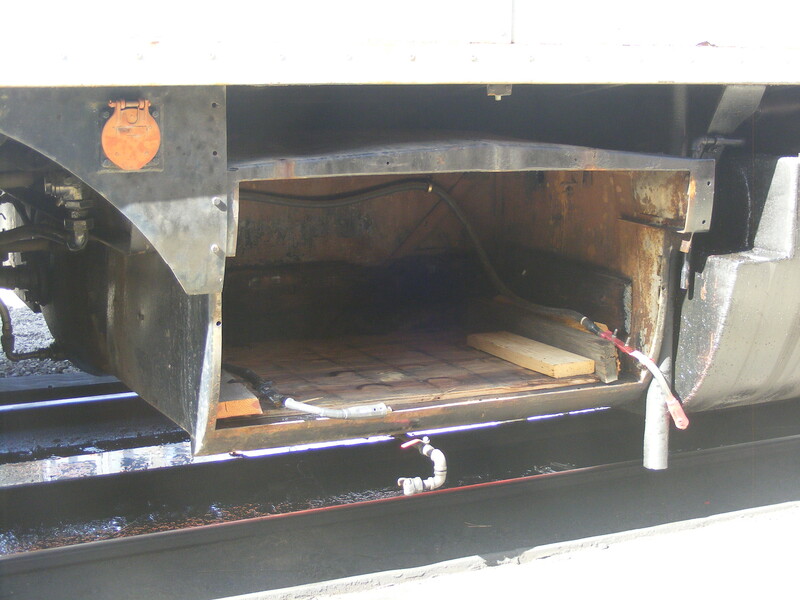 We utilize welding lead connectors to ease in connection/disconnection of batteries during servicing. Luckily the connectors are not hard to swap, and soon we were back to the task at hand. 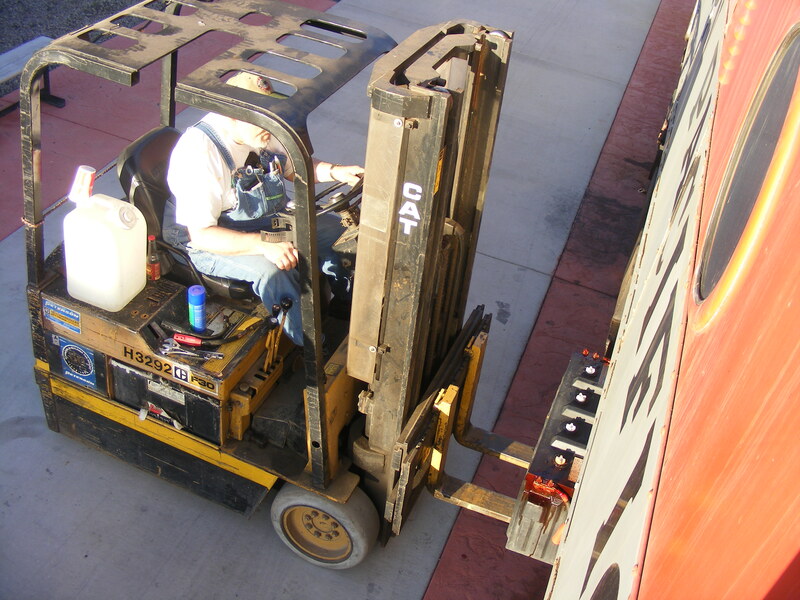 Steve applies terminal protector after installing the lead connector, whilst Poindexter waits at the helm of the electric forklift. It’s important to remember to use protection. Steve places the battery into its box. Photo taken from 917’s cab door, right side. WP917D was now complete, with two serviced batteries. All that was left to do was place them on a charger overnight. A cord was ran into the cab, and the charger turned on; initial output was 11 amps. This dropped to 8 amps after about an hour or so. Steve figured that the engine would be able to be fired up the next day. The charger putting out 11 amps. Photo by Matt Elems. I arose from my berth in the Edenwold sleeper next morning around 07:45. It was March 20, the first day of spring; and an uncomfortably warm morning. 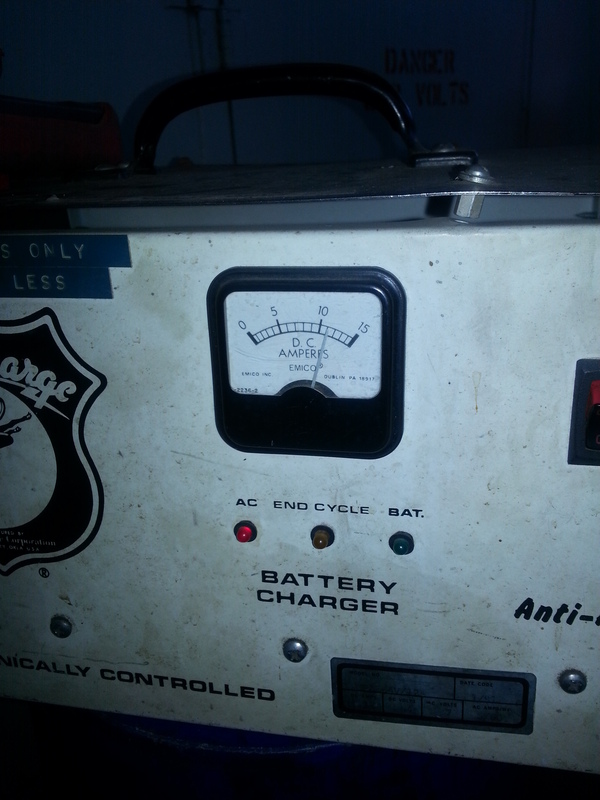 The Battery charger on 917 had dropped down to 6 amps overnight. At 13:30 I flashed the engine and started filling the cooling system. With the locomotive being parked at the water riser, I was able to use a shorter hose that didn’t leak; filling time was 26 minutes. This time around, the engine turned over and fired. Mechanically the engine ran pretty good, aside from the smoking rear stack. The only issue at this point was an air leak at the drain valve on the number one main res. tank, which wasn’t to big of a problem. The repair work done by Etan Doty back in January also seems to have held up; the oil jumpers between governor and load regulator are leak free as is the water hose on the block discharge header. The engine loaded up in both directions and is more or less ready for the coming season. The following day I returned to the museum to repair the leaking valve. My father, Greg Elems, drove out with me for assistance. 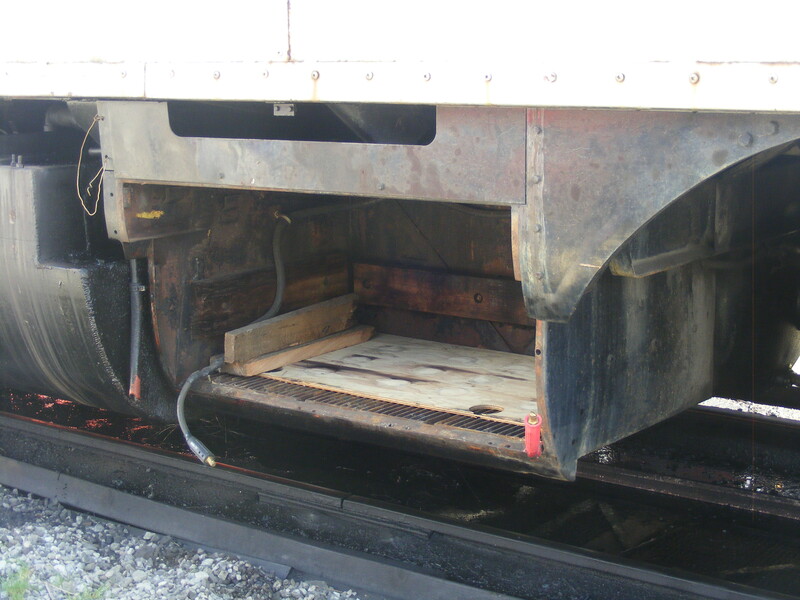 We fired up SP2873 and let it warm up, as we would need it to move 917 from the pan to the loading platform were there is enough ground clearance to crawl under the locomotive. This also allowed for some running inspections of top deck of 2873’s prime mover, which still has a slight knocking; it would seem to have a sticky hydraulic lash adjuster on one of the valve bridges of the number one cylinder. Once 2873 was warm enough for operation, 917 was spotted in position for repairs. I worked on getting the valve off the air tank and then repaired on the work bench while Dad scraped reflective striping off WP1503 to help prep it for painting this season. The valve had lost two of the four nuts that hold it together because the threads on the associated bolts had been stripped. This allowed the valve body to partially separate. Once rebuilt, the valve was reinstalled and 917 was fired up again for more inspections. With my fathers help I was able to trace the knocking and smoking of the rear stack to the number nine cylinder, which is next on my list for maintenance. At the moment, the unit is ready for service. This entry was posted in Maintenance and tagged Around the Museum, Mechanical. Bookmark the permalink.